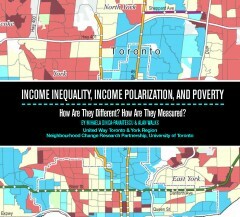 Report: Income Inequality, Income Polarization, and Poverty: How Are They Different? How Are They Measured? By Mihaela Dinca-Panaitescu, United Way Toronto & York Region, and Alan Walks, University of Toronto. This is a joint publication by United Way Toronto & York Region (UWTYR) and the Neighbourhood Change Research Partnership (NCRP) based at the Factor-Inwentash Faculty of Social Work, University of Toronto. This backgrounder explains the differences between income inequality, income polarization, and poverty, and describes how they are measured. The intent is to help readers interpret research and media commentary on income inequality and income polarization. The paper also lays the groundwork for further research on the Toronto Region that is part of the United Way Toronto & York Region’s Building Opportunity initiative and the Neighbourhood Change Research Partnership. Maps of high, middle, and low income neighbourhoods (census tracts) for eight Canadian metropolitan areas, 2012.
by Stephanie Procyk, Research Paper 232, United Way Toronto & York Region, and Neighbourhood Change Research Partnership, University of Toronto, October 2014.
by United Way Toronto & York Region, February 2015. A publication in partnership with EKOS Research Associates and the Neighbourhood Change Research Partnership, University of Toronto, funded by the Social Sciences and Humanities Research Council of Canada. by Alan Walks, Research Paper 227, Neighbourhood Change Research Partnership, University of Toronto, August 2013. Authors of Income Inequality, Income Polarization, and Poverty: How Are They Different? How Are They Measured? Mihaela Dinca-Panaitescu is a Manager of Research, Public Policy and Evaluation at United Way Toronto & York Region. Over the last 15 years, she has been involved in World Health Organization community-based projects and various research and evaluation projects focused on social determinants of health and how access to opportunity in Toronto is being impacted by income inequality. She has a master’s degree in environmental science from Ryerson University and has published in the areas of income inequality and access to opportunity, social determinants of health, and disability rights. Alan Walks is associate professor of geography and planning at the University of Toronto. He has written scholarly articles on urban social inequality and polarization, housing policy, gentrification of the inner city, economic restructuring, rising household indebtedness, gated communities, and neighbourhood-based political attitudes and ideology. He is co-author and editor of the books The Urban Political Economy and Ecology of Automobility: Driving Cities, Driving Inequality, Driving Politics (Routledge 2015) and The Political Ecology of the Metropolis (ECPR Press 2013).